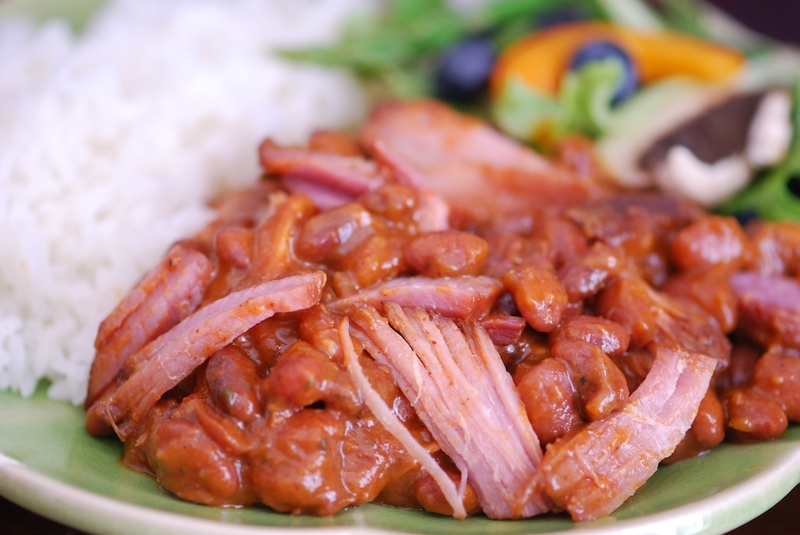 It was about time to use that beautiful Kurobuta ham bone in the freezer and I’ve been craving both red beans and BBQ lately – so violà! Ham and beans with a smoky BBQ flavor; possibly the best tasting ham and beans I’ve ever tasted! Tony’s Kurobuta Ham is only lightly salted and smoked, so I actually used a little more alder wood smoked salt and hickory smoke than listed in the recipe. Since hams can vary so much, take it easy with the salt and liquid smoke and make final adjustments after adding the BBQ sauce. It’s easy to add more, but impossible to take it out later! This dish is perfectly paired with rice, a refreshing salad and either cornbread or warm corn tortillas. Supper is ready – come and get it! Rinse and soak red beans overnight in 8 cups cold water – or boil in 8 cups water for 2 minutes, cover and rest for two hours. Rinse well. Sauté onions, carrots and celery in oil until tender. Add beans, ham shank (have your butcher cut into 1-2 inch slices on the saw) or ham bone, water, spices and herbs and bring to a boil. Skim, cover and reduce heat to a simmer for 2 hours, stirring occasionally. Remove meat from ham shanks and return meat and bones back into the pot. Add liquid smoke and bbq sauce to taste* – taste and adjust seasonings and herbs, cover and simmer one hour longer or until beans are tender. If a spicier dish is desired, season to taste with a hot sauce of your choice. Serve hot with rice, salad and cornbread or warm tortillas. *Notes: The saltiness and smokiness of ham shanks and ham bones vary, so tasting and adjusting is a good idea. Add salt sparingly at first and taste before adding liquid smoke and BBQ sauce. It’s better to under season at first and adjust towards the end of cooking.